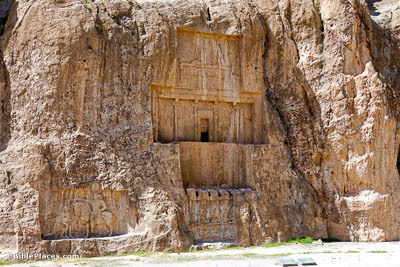 Just north of Persepolis is an imposing set of tombs carved into the rock, known now as Naqsh-e Rostam. 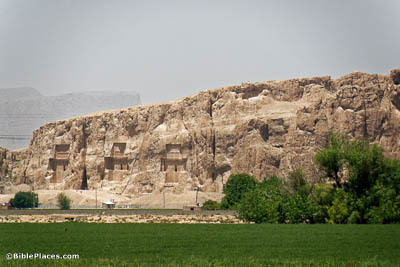 Most of the Achaemenid kings were buried here, beginning with Darius I. His son Xerxes I and grandson Artaxerxes I followed his example. 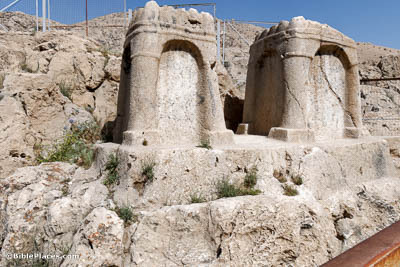 Even the usurper Darius II chose to be buried here, continuing the tradition. 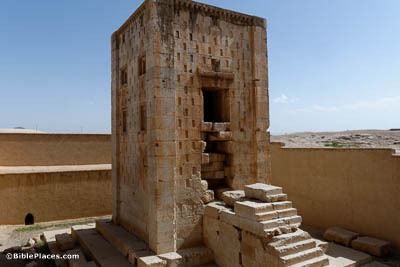 The tombs are all of a similar style, with the burial chamber entrance surrounded by reliefs. Analysis suggests that these reliefs were originally painted. The tomb pictured here belongs to Darius I; incidentally, his is the only tomb to have an inscription that explicitly names the occupant. The upper panel of each tomb façade depicts the king standing on a stepped platform. This platform stands on a base supported by 28 figures, who symbolize the 28 nations of the Achaemenid Empire. 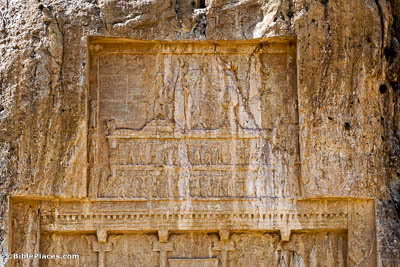 Several reliefs at Naqsh-e Rostam date much later than the tombs, belonging to the 3rd century AD. This one displays investiture imagery similar to the famous reliefs at Bishapur. 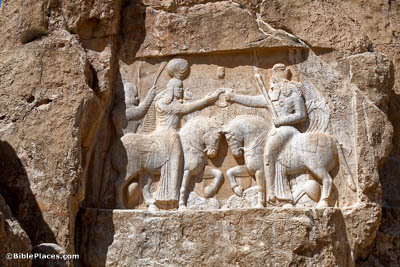 Ardashir I (AD 224–242) is depicted accepting a royal ring from Ahuramazda, the Zoroastrian god. A mysterious tower stands near the cliffs, seemingly constructed in the early 6th century BC. It may have functioned as a fire temple, or it may have been another tomb. Either way, it was later embellished with an inscription from Shapur I, detailing his victories over Rome. Fire altars such as these were used for holding a sacred fire, possibly in a metal or clay bowl. 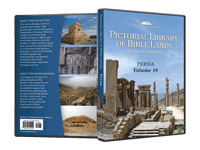 Sacred fires were significant in Persian religion from the time of the Achaemenid dynasty through the Sassanian period. They are usually associated with the Zoroastrian religion.